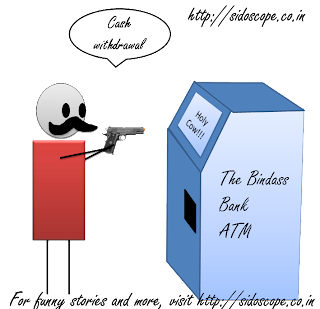 Wordmore Wednesday: The curious case of ATM center. Was seeing Wordless Wednesday a lot on the reader, so decided to write more. Wordmore wednesday. Yeah, I am crazy. 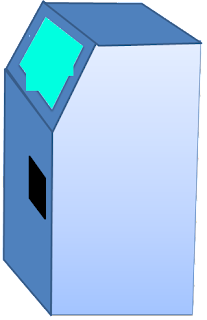 Have you ever gone to the local ATM center on a hot sunny day? Obviously you have, because apparently everyone has to remove money exactly at the same time when the sun is at its peak and you are melting faster than a snow cone. 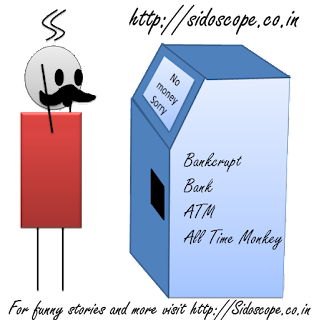 Have you observed the monkeys at the ATM center? When ATM was invented, it was innovation, get money from any where, any time. Oh yeah, but the innovator forgot to consider the potent of human mind, which has the knack of destroying all new innovation. There are few curses associated with the ATM center. Like, whenever you are in dire need of money, the ATM center will have 500 bucks or worst 1000 bucks only. Now, in normal cases (read: the first 5 days after your salary) will not be a problem, but after that every penny that sits in the computer is safe. So you leave that money safe behind the ledgers and come out hunting for another ATM machine in the vicinity. If the curses are not enough around the ATM center, stranger people tend to surround the ATM center. And the length of the line outside the ATM center is inversely proportional to the size of brain of the people using it, for example, a few days ago outside a SBI ATM, a man walked out from the machine. 'The second machine is broken,' he announced to no one in particular. The age old tendency of being Indian, passing advice when no one needs it. People standing in line gave a sign of sadness. Everyone pooled towards the single machine which was working. Now, I do know the tendency of a human mind to go to odd lengths to prove they did originate from monkeys, so I silent went to see the 'broken' ATM machine. Wonder why I was not surprised to find the machine perfectly fine and I removed my cash and walked away. People in the line, which I broke to test the broken machine looked at me as if I just parted the red sea for them to walk. ATM is a private affair, you get a million thoughts while remove the 500 bucks from the machine. For instance, I always remember my mobile bill (even if it paid) whenever I remove cash from the ATM. But obviously if you are living in India, nothing is private affair unless you plan a bigger than 2G scam. There are people who shamelessly stand behind you whenever you are in a ATM center. Now, no obviously they mean you no harm, what harm can the village idiot cause you, unless of course kill you in his play? no, they mean you no harm, but cause you horrible discomfort. Not only will they stand behind you, they will also discuss current weather, ATM status and if your day is full of bad luck, also ask inquire about the money that you are removing, just like your colleagues will keep on reminding you that you spilled chutney on your shirt in office again and again. I know. Then there are those who think ATM is the synonym for Automatic Targeting Machine-gun. They dread the machine so much, that they exercise extreme caution around it, as if the machine is a time machine and they will be ported into another dimension. Many a times, the machines are eccentric. They not only give you confusion answers, they also make you think. There was a machine near the petrol pump, which gave me a jigjag pattern to press. Do you want a printed record. WTF. Took me a complete minute to understand. Some ATM are stranger than usual. 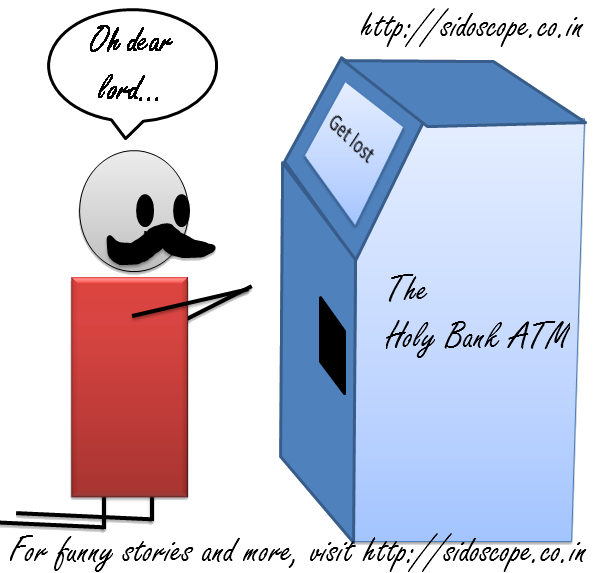 Due to the age old curse that ATM will not be available when you need it most, I found myself stranded on a deserted street in dire need of money. Opposite the street was ATM from another bank (which I never knew existed till that day) happy with my luck I entered the ATM center and behold, the machine spoke. 'Welcome to ATM center. Please enter you PIN number' in the most horrible voice possible. Doesn't that creep anyone? Remember the days when ATM was a private affair? Ah so, if you are wondering, I am writing this post from the Blogger for Android standing in the queue for ATM center and I have not moved a inch since last twenty minutes. The people are different that they were when I stood here. Hmmm. Oh wait. P.s. Lots of changes to the new layout, giving you tips using Sidoscope, simplified navigation and a better and faster Sidoscope. Comments and suggestion are welcome. Try the new book download available for the price of a tweet, only for you. Lol this is why I never miss your posts. Keep making us laugh like this...always! :-) Happy ATM-ing. for some reasons i found the old look of the site better...but this ones cool too.